The Macy's Thanksgiving Day Parade will move its giant balloons and floats one block east next year to accommodate work on the Times Square pedestrian plaza, infuriating businesses that who cater to the tens of thousands spectators at the hugely popular annual extravaganza. The parade will move from Seventh Avenue to Sixth Avenue for 2012 and 2013 and, after that, the route will be re-evaluated, said Jason Post, a spokesman for City Hall. The Times Square Alliance, which represents the hotels, restaurants, delis and coffee houses along the parade's route, said it learned of the route change from a reporter for DNAinfo, a Manhattan news website. The new route also was reported by the Daily News. "Even Mr. Potato Head and Homer Simpson know that Times Square is a better place for a parade than dull Sixth Avenue," said Tim Tompkins, president of the alliance, referring to two of the parade's giant balloon characters. "I think Macy's jumped the gun on this," said Tompkins. He said the alliance had been "in active conversation" with both the city and Macy's regarding the parade route but had not heard directly from either about the changed route. "We knew there were some issues that needed to be dealt with regarding the reconstruction in Times Square," but the problems were not insurmountable, he said. A message left for Macy's was not immediately returned. Tompkins said the Seventh Avenue route is home to 7,000 hotel rooms, twice as many as Sixth Avenue, a corridor dominated by office towers. Many of the hotels have rooms facing the parade, and people book two- to three-night stays a year in advance, Tompkins said. Seventh Avenue also has 50 percent more retail space and restaurants than Sixth Avenue, he said. The two-year Times Square project is slated to begin in the fall of 2012. Modifications will include repaving and curb installation. 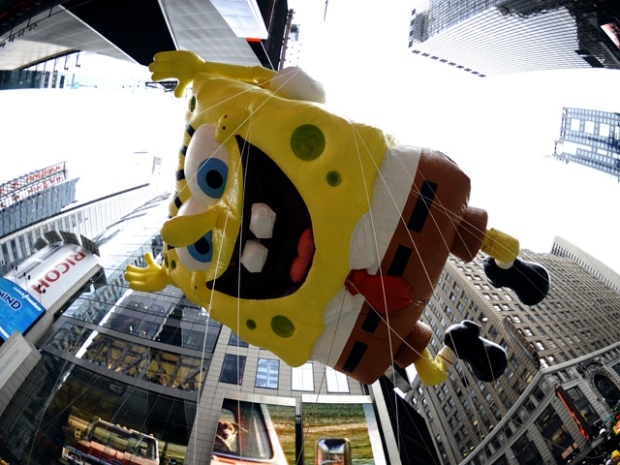 The Macy's Thanksgiving Day Parade is the largest in the nation, featuring giant balloons of cartoon and movie characters, colorful floats and a lineup of celebrity performers. Millions watch it on television. In 2009, the parade's route was changed from Broadway to Seventh Avenue when vehicles were banned from parts of Broadway. For the last two years, the parade started at Central Park West and 59th Street and then proceeded down Seventh Avenue to 42nd Street before turning onto Sixth Avenue to Macy's flagship store at 34th Street.